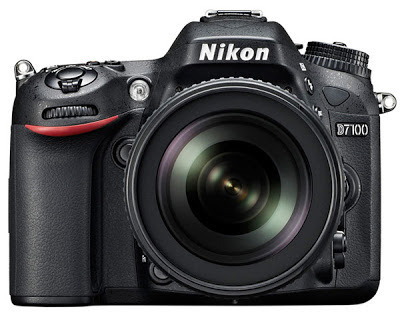 Nikon has announced the release of its new mid-range SLR camera, D7100. The camera sports a new 24.1MP DX-format CMOS sensor that works without the OLPF a 51-point AF system, a new 3.2" 1,229K dot LCD monitor, EXPEED 3 image processing engine, continuous shooting mode up to 8 fps, full 1080p HD video recording capabilities, Creative Effects and 1.3x Cropped modes and wireless connectivity. The camera is intended for experienced photographers and will be available in March for a body-only price of $1,199.95. 100% horizontal and 100% vertical approx. MELVILLE, N.Y. – Nikon Inc. today announced the D7100, the HD-SLR that ushers in a new era of DX-format image quality and functionality for the experienced shooter and photo enthusiast. The lightweight Nikon D7100 has an impressive array of intuitive features and controls bolstered by rapid performance and a robust feature set that includes a new 24.1-megapixel CMOS sensor, Nikon’s 51-point AF system and wireless connectivity. New 51-Point AF System - The D7100 features Nikon’s professionally proven and lightning-fast 51-point AF system, with a new Multi-CAM 3500DX AF module. Additionally, the AF system and exposure are augmented with Nikon’s 3D Color Matrix Metering II 2,016-pixel RGB sensor and Scene Recognition System, which recognizes the scene prior to shooting in order to adjust AF, AE, AWB and other parameters. The results of this system are accurate and even exposures, sharp details and vivid color, frame after frame. For additional precision, 15 of the 51 AF points are cross-type, and the center point is functional at f/8, giving DX photographers an additional telephoto advantage when using a teleconverter. Rapid Response and Operation - To help ensure the decisive shot is not missed, the D7100 can shoot at up to six frames-per-second (fps) at full resolution and up to seven fps when using the new 1.3x crop mode at slightly reduced resolution. Overall operation and image processing is swift, while startup and shutter lag is nearly imperceptible with a release time lag of 0.052 second (CIPA). Image data is also written to dual SD card slots, which accept the latest high-speed UHS-1 and SDXC cards. Enhanced Interface - To make it easier for users to quickly access frequently used functions, the “i” button has been added to the enthusiast-oriented control layout on the camera. In addition to the D7100, Nikon also announced the WR-1 Transceiver for Nikon D-SLR cameras. This device uses the 2.4 GHz radio frequency for maximum range when communicating with the camera, extending the range and functionality2 for remote shooting applications. The communication range between WR-1 units is approximately 394 feet3, and 15 channels are available. Users also have the ability to remotely control a camera (with a WR-1 used as a receiver) attached by operation of another WR-1 (used as a transmitter), and also perform simultaneous or synchronized release of shutters on several cameras using the WR-14. Furthermore, there are a wide variety of options for remote shooting, which include dividing remote cameras into groups and controlling each group separately and interval timer photography. Remote shooting by combining the WR-1 with WR-R10/WRT10 wireless remotes is also possible5. The Nikon D7100 will be available starting in March 2013 for the suggested retail price (SRP) of $1599.95* with the AF-S DX NIKKOR 18-105mm f/3.5-5.6 VR lens or $1199.95 for the body only configuration. Additionally, the new MB-D15 battery grip and the WR-1 transceiver will also be available in March 2013, and pricing for these products is not yet announced. The WU-1a Wireless Mobile Adapter is currently available and has a suggested retail price (SRP) of $59.95. For more information on the new Nikon D7100 and other Nikon products, please visit www.nikonusa.com. Nikon, At the Heart of the Image™. Nikon Inc. is the world leader in digital imaging, precision optics and photo imaging technology and is globally recognized for setting new standards in product design and performance for its award-winning consumer and professional photographic equipment. Nikon Inc. distributes consumer and professional digital SLR cameras, NIKKOR optics, Speedlights and system accessories; Nikon COOLPIX® compact digital cameras; 35mm film SLR cameras; Nikon software products and Nikon sports and recreational optics as well as the Nikon 1 advanced camera with interchangeable lens system. Nikon Corporation, the parent company of the Nikon Inc., recently celebrated its 80th anniversary of NIKKOR optics, and announced the production of over 75 million NIKKOR lenses in 2012, creating a new milestone in Nikon’s heritage of superior optics. For more information, dial (800) NIKON-US or visit http://www.nikonusa.com, which links all levels of photographers to the Web's most comprehensive photo learning and sharing communities. Connect with Nikon and other photographers on Facebook at http://www.facebook.com/nikon and get the latest news and information from Twitter by following @NikonUSA.